The Warré hive type was chosen, a top bar hive, without the frames and foundation typical of the Langstroth hive. 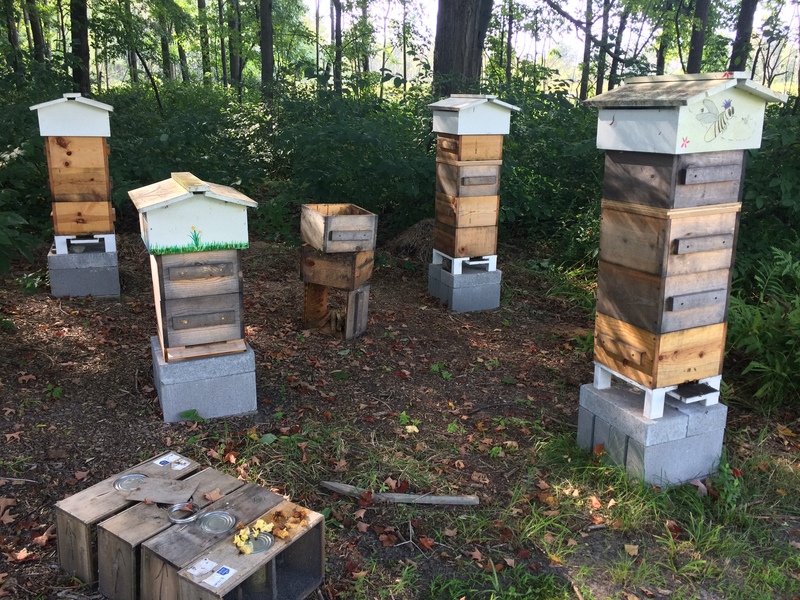 The Warré is a hive used in natural beekeeping circles, and that’s where we wanted to be. It has its advantages and disadvantages to be sure. An advantage is that the hives are relatively easy and inexpensive to build. This was detailed in two earlier posts, WARRÉ BEE HIVE CONSTRUCTION – PART I and WARRÉ BEE HIVE CONSTRUCTION – PART II. I have only made three modications in contravention of Warré’s original design. In the spring of 2016 I ventilated the “quilts” with two 1 inch holes. And, this spring, I modified my hive floors to include a screened bottom board, and raised the hives from the ground about 18 inches. The first year installation of new bee packages did not go so well, and feeding the new colonies also did not go well. Frankly, I made of mess of things. You can read all about it in a post I made that spring of 2014, LATE SPRING UPDATE FROM THE HOMESTEAD, PART I. You can find all of our posts regarding the making of local honey and beekeeping here. Since that first spring we have made improvement to the process and equipment year by year, and this spring we harvested our first raw honey, put up by the bees in 2016. Unfortunately none of the colonies that produced that 2016 honey survived to see the spring of 2017. I will admit, that realization was pretty disheartening, after all of the investments made, of time and money. Still, persistence is practically all-powerful, and so we persist. There are many reasons why colonies fail, from Varroa mite infestation to the so-called “colony collapse disorder.” Truth is, we did not identify a definitive cause. We did take the two actions I mentioned earlier to improve our odds, raising the hives and incorporating screened bottom boards. Time will tell. The installation this year of 4 new packages of bees went relatively well, the only problem being that the Queen in the package intended for hive 1 was dead on arrival (DOA). A replacement Queen was ordered that day, a Wednesday, but it did not arrive until the early the following week. Installation of the replacement went well; a check of the Queen cage 2 days later showed that the bees had released her. At installation it was decided to harvest the honey left behind by the 2016 colonies. 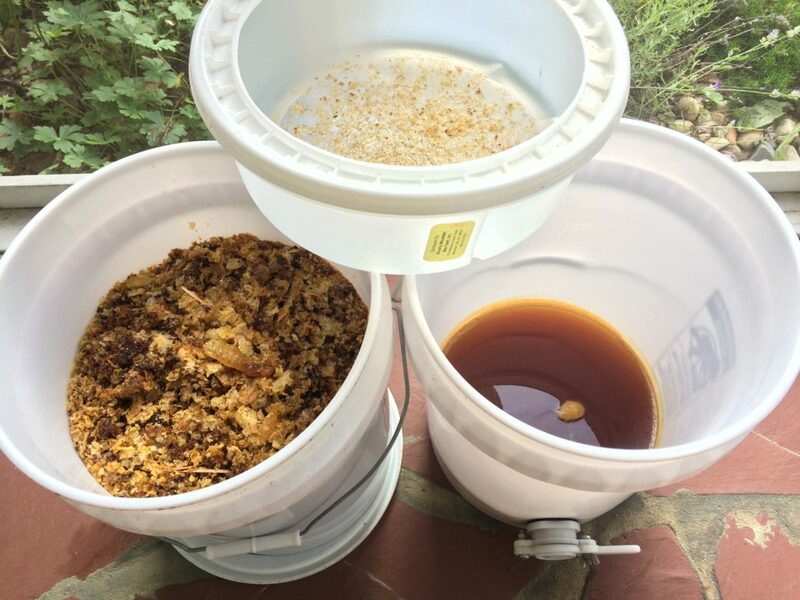 It is raw honey, as mentioned before, and we use the “crush and strain” method to process it; no heat. Delicious does not begin to describe it. This process too needs improvement, as there is a substantial amount of raw honey still clinging to the comb. Some sort of press is on my mind, but has yet to be implemented. Fast forward to today. Hive 1 is now dead, I suspect the late arrival of a live Queen doomed the hive from the start. Hive 3 does not appear to be thriving, but the bees are soldiering on at a slow pace, as is their nature. Hives 2 and 4 are rockin’ the house! Yesterday I added a fourth box to both hives 2 and 4; pardon the wind noise please, and check out the video! It was a great experience, adding the box, “bee escape board,” and videoing the process, so if you haven’t already, please enjoy. Is More Raw Honey Next? The short answer is, I have not harvested, and I have not made the decision to harvest. I may harvest early next week, from both hives, I may not harvest at all, or I may harvest only from hive 2, which appears strongest. Whatever happens, I will keep you posted. I contribute frequently on Facebook, so to stay current with the goingson, click HERE, Like and Follow. Thanks Marcelle! I think I’ve decided not to harvest this year … that’s not final. I’ll contact you by email. And, thanks so much for reading and commenting!